Nestled in the heart of the Three Valleys ski area, the French resort of Méribel is a popular all-rounder. It’s home to some of the finest snow parks in Europe, with off-piste terrain to keep even the most advanced riders and skiers challenged. There are plenty of long, sweeping runs ideal for intermediates, as well as diverse, lively nightlife. But the story doesn’t end there, because Méribel also works brilliantly for families and children. The resort achieved ‘Famille Plus’ status back in 2013 for its outstanding family-friendly services and infrastructure, and it demonstrates continued commitment to the needs of parents travelling with kids. With winter 2018/19 now on sale and keen skiers snapping up low-season deals on their first-choice chalets, here are a few reasons for families to make Méribel their next Alpine destination of choice. The ski schools operating out of Méribel include Parallel Lines, Oxygène and BASS — and the level of tuition is broadly acknowledged to be among the best in the Alps. As you’d expect from ski schools of this stature, all levels and pursuits are covered, with instructors trained to the highest standards. 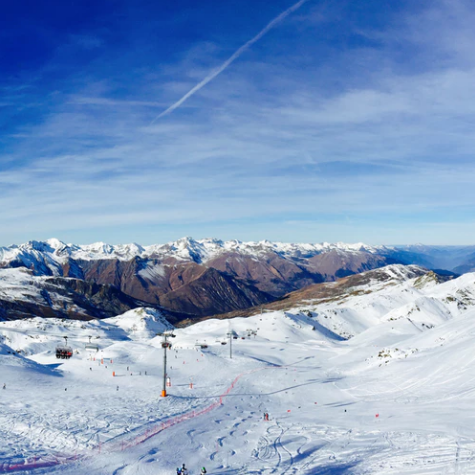 For more details about ski tuition in the Alps, check out our blog on ski school recommendations. From hotels with in-house childcare services such as the beautifully located Hotel Alba to nursery and nanny companies like Jelly and Ice Cream, parents considering Méribel as a ski destination have all bases covered. One of the main reasons Méribel remains popular is its central location within the Three Valleys, but this would mean nothing without a strong lift system. The resort invests millions each year upgrading and improving its chairlifts and gondolas, and the results are clear to see. From La Chaudanne, a fleet of swift and modern lifts whisk skiers to the Saulire and Tougnète peaks, and into the Altiport, offering easy access over to Courchevel, les Menuires, Val Thorens and more. This means that even on peaks dates like Christmas or half term, the lift queues are manageable. Méribel’s Altiport sector ranks among the best places in the Alps to master your first turns on the snow. Tree-lined and sheltered throughout, with a gentle gradient perfect for beginners, the Altiport is the go-to area for ski instructors teaching learners the ropes. And when learners are ready to move on to steeper terrain, the rolling blue and red runs of the Méribel valley are within easy reach. It’s a reality when taking kids to the Alps, that there’ll be days when they don’t want to ski or the weather closes in. On these occasions, parents rely on non-ski activities to keep the gang entertained. Outdoor activities in Méribel worthy of particular note include husky-sledding, snow-shoeing and ice-skating, but there’s also an Olympic-sized swimming pool, climbing wall and plenty more besides. If all this talk of Méribel has piqued your interest in the resort for your winter 2017/18 ski holiday, chat over the accommodation and travel options with one of our knowledgeable staff members today. You call us on 020 30800 202, or get in touch via our helpful online chat facility. And for more details on the resort as a whole, have a look at our insider’s guide to Méribel.